The NextGen Genealogy Network is pleased to welcome Kathleen Kaldis as our Hereditary Society Outreach Coordinator. Kathleen worked at the New England Historic Genealogical Society, and has served as a researcher and a genealogist within the Society. She has recently left NEHGS to start her independence research services business and is currently accepting clients. She has presented many lectures on various genealogical topics, and enjoys sharing her knowledge with individuals. 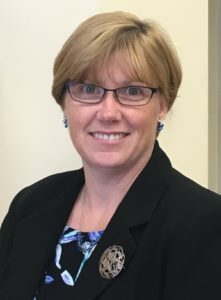 She holds a Certificate in Genealogical Research from Boston University’s Center for Professional Education and successfully completed the SLIG Advanced Evidence Practicum in 2018. Kathleen is very active within the genealogy community. She serves on the board of the Massachusetts Genealogical Council (MGC) as their Federal Records Director. In 2015, she represented the MGC at the PBS Genealogy Roadshow in Boston, Providence, and Houston. She became a member of the Daughters of the American Revolution in 2010, and has enjoyed sharing her passion for genealogy building membership for the Society. She is a member of the Lexington DAR Chapter, and has served in many leadership positions within the Society at the national, state and chapter levels. During her tenure as Chapter Registrar in the Lexington Chapter, she volunteered her time actively researching lineages, gathering proof, and doing whatever it took to complete prospective member’s applications. Through her efforts and research contributions, the Lexington Chapter gained over a hundred members. She passed the DAR Genealogical Education Programs I, II, and III, and carries the title of NSDAR Volunteer Genealogist. She volunteers as a DAR Balcony Volunteer at the DAR Library every June for the DAR Continental Congress. In 2013 & 2016, she was the Massachusetts Daughters of the American Revolution Outstanding Volunteer Genealogist of the Year. She has conducted and participated in many genealogy workshops throughout the state for both prospective members of the DAR, and for the public wishing to learn about their lineages.